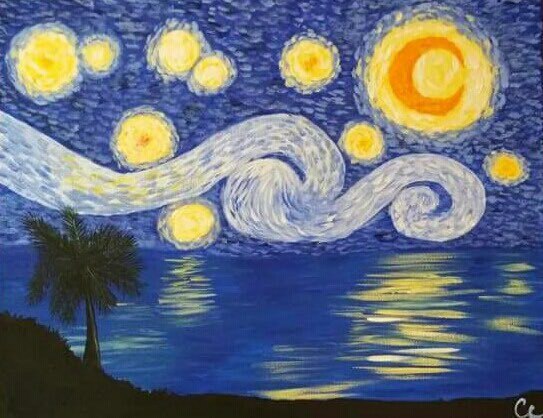 May 11th- "Coastal Starry Night"
Come paint "Coastal Starry Night" with us on Wednesday, May 11th at 6:30pm. We will be at Carrabba's Italian Grill on Baymeadows. This painting is fun and easy to learn with step by step instructions. Come Drink, Laugh, Paint! RSVP 24 HOURS in advance or Contact Colleen Chandler If you wish to attend and would like to pay the night of the party, instead of paying online. We look forward to seeing you there!! If you do not wish to reserve online you MUST contact Colleen Chandler to RSVP for your seats, to pay the night of. RSVP for your seats soon! Seats are first come first serve! Visit our private parties page to see all our information on our private parties! WE SET UP, WE CLEAN UP! !